The Days of Johann, an agility dog! : What's that noise! For several days, Mum, Gracie and I have been hearing birds out on our walks....types of birds we haven't heard since we've been here. For a couple of days we would go in the direction of the noise to see if we could find and identify them. They would always sound like they were just over the bend, or over the hill. So close! We just had to know what they were. Pheasant? Grouse? Quail? Mum would hear them, stop us and say 'listen.' That's when Gracie and I stand very still and quiet and look around to see what's up. We've done the 'listen' on our hikes so much now that it's second nature to us, didn't even need treats to train us to stay that still and quiet, BOL! Well, the next day Mum heard the birds again and this time she looked up, way up! And we finally found out what they were/are! 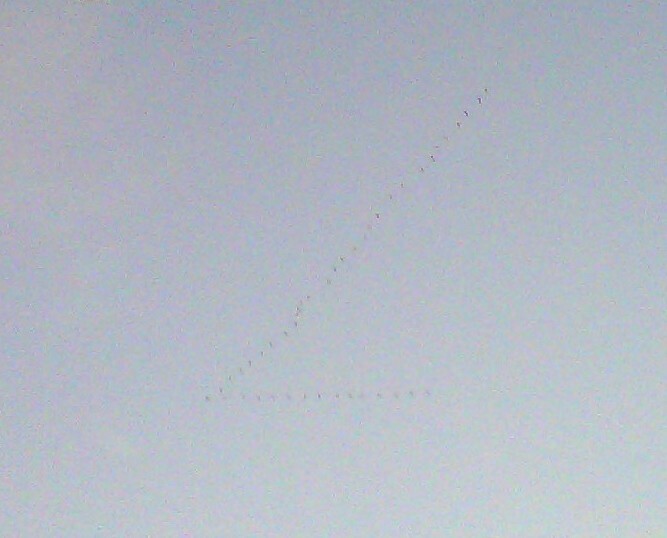 Geese, hundreds of them, flying south for the winter. Here's a really bad photo Mum got with our BB of them way, way up in the air above us that day! We saw three v's just like this. Guess those Geese won't need any tanning bed lotion where they're going, BOL! Then we got to thinking, why do birds fly in a V? Well, seems they are pretty smart, not bird brains at all. The V is designed to reduce drag, hence reducing the energy they expend when flying those long trips south. Here's a great blog post we found talking all about it, very interesting! EDIT: My friend Ricky thinks they were Sandhill Cranes flying overhead, not Geese. We did a quick Internet search and found this article from one of our favorite identifying sites - Cornell Lab of Ornithology. Yep, that's the sound! Thanks Ricky! You know what Johann? I think those were sandhill cranes flying overhead, not geese!!! It sounded like the cranes on the video to me. They fly high up in the sky. Geese would be honking (sort of sounding like barking). 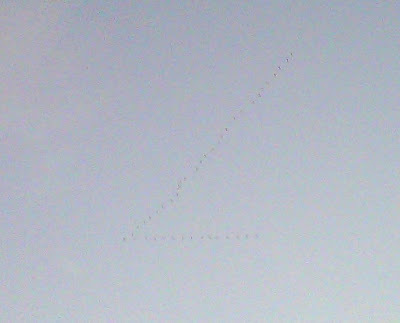 Mom and I heard and saw sandhills flying over our house last year but I forget what month. If I'm right and they were sandhills it's way too cool!! Oh, very good Ricky!!! I bet you are right...that's why Mum couldn't find just the right bird sound, looking in the wrong direction, thanks! Very cool!